Days of Our Lives (DOOL) spoilers tease that Eve (Kassie Depaiva) will stun Victor (John Aniston) and Brady (Eric Martsolf) with a huge bombshell next week. Eve’s been keeping a massive secret that’s sure to shake things up a the Kiriakis mansion. Her announcement will certainly throw everyone for a loop. Many DOOL fans assumed Eve’s secret might have something to do with her sister, Theresa (Jen Lilley). Brady isn’t exactly the best father in the world, so viewers thought there could be a custody issue with Tate as well. That’s still a story that could be explored later, but it’s not the shocker Days intends to deliver first. Trust us when we say that no one saw this coming! Days of Our Lives spoilers state that Eve will barge in the mansion and prepare to rule the roost. Naturally, Brady and Victor will wonder why Eve suddenly thinks she can be so pushy. They might even tell Eve to get lost. That’s when Eve will send their jaws to the floor. She’ll reveal that she’s Mrs. Deimos Kiriakis (Vincent Irizarry). Wait…what?! Yes, you read that right. Eve apparently married Deimos off screen and now she’s back as the monster’s widow. This obviously coming out of nowhere, but there’s a lot of potential for drama. 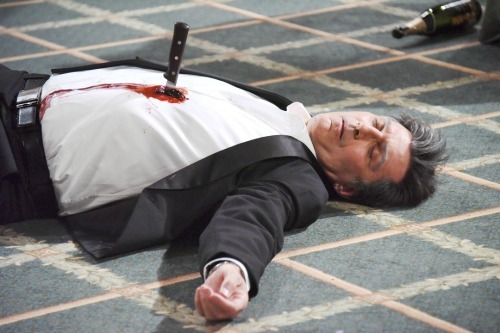 It seems Ron Carlivati, DOOL’s head writer, wanted to throw in a fun surprise and watch all the other characters reel. Even better for fans is that Vincent Irizarry has returned and filmed NEW scenes with Kassie Depaiva! Naturally these scenes will play out as Eve’s memories with the demonic Deimos but DOOL fans will get to see more of the brilliantly talented Mr. Irizzary. Kudos to Ron Carlivati for his brilliant work running Days of Our Lives! It makes sense that Eve will want to move in the mansion and perhaps have a hand in running Titan. Brady thought Sonny (Freddie Smith) was his only competition for CEO. He didn’t count on Eve returning to stir the pot. Victor took steps to muscle Deimos out of the family by cutting off all Titan resources, but that won’t matter to Eve. Since she was undoubtedly under Deimos’ spell, she’ll feel like he was treated unfairly. Days spoilers say Eve will fight for what she believes she’s owed. Of course, Deimos and Eve’s marriage brings more questions. When did they hook up? How did this relationship develop when Deimos was busy chasing after Nicole (Arianne Zucker)? Did Deimos simply marry his side chick after Nicole rejected him? Was Deimos actually going to steal Holly and raise her with Eve? Days of Our Lives spoilers indicate that some newly created flashbacks will fill us in on the whole story. It sounds like some interesting explanations are ahead. We’ll give you updates as other DOOL news comes in. Stick with the NBC soap and don’t forget to check CDL often for the latest Days of Our Lives spoilers, updates and news.